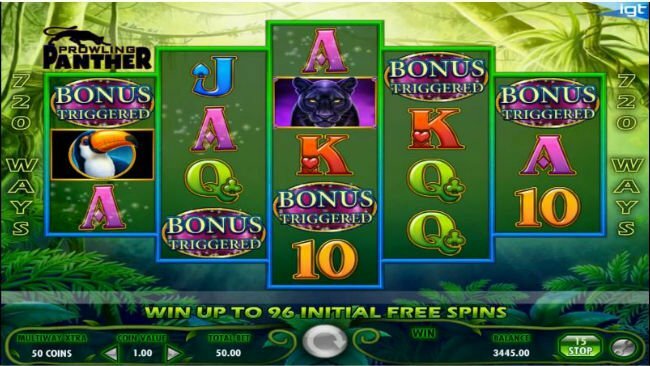 The Prowling Panther slot machine has wondrous imagery, and takes you into the heart of the jungle, following panther symbols, as you stalk your way to a non-progressive jackpot worth 500x your total bet. A massive 720 paylines feature in the Prowling Panther game. Now, let’s delve into the Prowling Panther slot review, to see what else this game can offer you. IGT’s Prowling Panther game contains a host of excellent graphics, all of course centered on the creature itself, and its jungle neighbors. The Black Panther, Toucan and Parrot symbols are the best paying, whilst the high playing card icons cough up smaller wins. This game – like many IGT slots – isn’t the cheapest to play. Players can are kind of forced to use the Multiway Xtra feature, and that seriously bumps up your wagers. At its cheapest, the slot will set you back around about 50p per spin. If you’re going all out when playing the Prowling Panther slot, then you can bet as much as £2,500 per spin. Prowling Panther features plenty of double wilds. These exciting symbols can count as two icons when they are found. These symbols are simple enough to spot (they have 2x written on them), and can substitute themselves for all standard playing icons (animals and high playing cards). The wild symbol in this game can only appear on the second, third and fourth reels. Players will naturally be drawn to the golden panther icon. This is a very special symbol, and if it appears on all 5 of the reels consecutively, then the player will trigger a free spins bonus round. The symbols is a scatter by nature, although unlike in many other slots, the Prowling Panther slot does not really offer you scattered wins for this icon, just your bet back. When it comes to Prowling Panther slot bonuses, the free spins bonus is the best. Initially, players are offered a total of 8 free games. They will also be awarded additional free games if they line up 5 more of the golden panther scatters on the reels during this bonus. Up to 256 free games can be won in this manner. 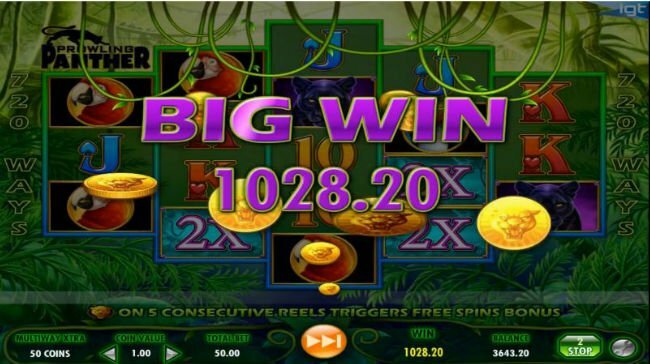 The free spins bonus round also takes place on a separate set of reels. 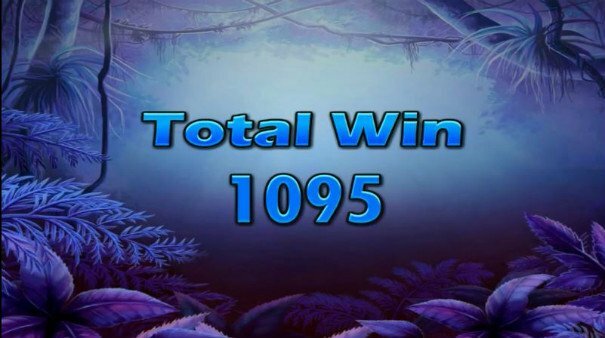 There is little difference in the amount you can win the symbols (which are the same as in the base game), although some of the better paying symbols do tend to turn up more frequently when the free spins bonus is in play. The Prowling Panther slot machine game does have a lot going for it. Is it the best slot ever released into the online casino world? No. Does it have enough features and bonuses for you to warrant giving it a whirl? Absolutely. If you can forgive the high wagering range, this slot does have rather generous winnings, which is always appreciated.